This is a good book. This is a more than decent final book to Discworld. This is a book as written by a man who has been fighting for years with an illness that threatened his own mind. And it's actually an excellent draft for a finished novel. 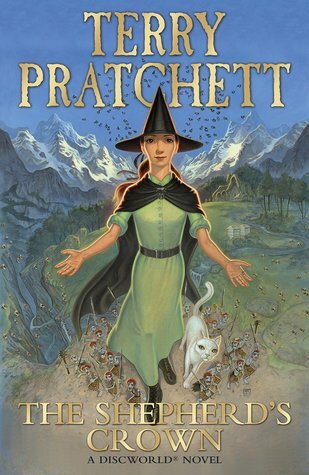 It is not, sadly, a very good Terry Pratchett book. It is a done story. As the afterword says, it has a beginning, a middle, and an end, with all the proper connecting dots. But you can see where it is unfinished, where Pterry would have polished more, where characters needed depth and are little more than cardboard cuts, where stories like Nightshade's needed more time and more breathing room, where cuts would have been made, and gentle edits edited (particularly all the gendered stuff, whoo boy). I am not sad at this book being the end of Discworld. It's certainly a better fit than Unseen Academicals or Raising Steam. But I'll admit, I do wish it had been written at the height of his writing prowess, because it would have been brilliant. Sign into Goodreads to see if any of your friends have read The Shepherd's Crown.